Mundosparalelos Information Dance Plymouth Pole Pole Dance Photography and Health news. 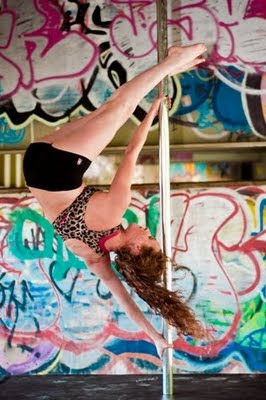 Pole Dance Photography and Health news. It is now just over 3 months since my knee injury and for the first time since then I feel almost back to full pole fitness, OK so I won't be doing the cupid for a while but most pole moves are back within my reach. Last month I did my first post-injury pole dance photo-shoot which really highlighted that I was not back to my required pole fitness and it has really boosted me to get back into training. Mark Doyle, aka Miso Photography, had an idea for an urban themed pole dancing photo-shoot at Marsh Mills in Plymouth directly under the A38 dual carriageway. The area is a mass of concrete and steel bedecked in fabulous graffiti. I have included a few of the shots from the day on this blog but you can view the rest by going to the Art of dance photo gallery and selecting Mark Doyle Photography from the images menu. As this is the first time Mark has worked with a pole dancer he has yet to learn that we do not have infinite strength and there are some poses that I simply can't hold for too long especially as I am still regaining strength after my pole absence. Mark still managed to get some great shots and we hope to being working on another exciting photography project very soon. Mark Doyle is available for commercial and private photography so if you need a photographer just give him a shout. A few bits of health news that I wanted to share with you; the government have released new guidelines on physical activity and how much we should be exercising. The guidelines start by focusing on those under the age of 5 and recommend 180 minutes of exercise per day, the over 5's are advised to exercise for at least 60 minutes (moderate to vigorous intensity)per day with the government recognising the importance of running, jumping and dancing for bone and muscle development. For adults the guidelines have changed from the previous guidance of exercising 3 times per week to a more sensible approach advising exercising daily with a minimum of 150 minutes per week which should be easily achievable for even the least active amongst us. These guidelines extend to the older generations but with an emphasis on exercise for improving balance and coordination to reduce the risk of falling and to aid mobility. Are you meeting the criteria? For more information just visit the Department of Health website or the Change for life website. Finally a great bit of news from scientists on how much sleep we should be getting, I can finally justify the need to sleep for 10 hours a night as it will seriously benefit my pole dancing practice! The findings come from Stanford Universities Cheri Mah who says "Many athletes testified that a focus on sleep was beneficial to their training and performance. For full details of these marvellous findings visit the BBC News/Health website. More news to follow on the Sexual Encounter Establishment licensing and how it will be implemented!